A recent Sunday programme on TVNZ reported on a “remarkable survivor” of World War II who arrived in New Zealand in the 1950s. This was not a Jewish refugee who survived the war and the horrors of death camps. Nor was the subject of celebration an ANZAC survivor of an alpine ski unit. The reporter, Cameron Bennett, was interviewing Willi Huber – a former Nazi Waffen SS soldier. Huber’s Nazi past was given a light once-over treatment by a fawning Bennett. His main focus was the fact that the nonagenarian helped build the Mt Hutt ski resort, and is still skiing at his advanced age. It was a feel-good item that was poorly handled and that badly misfired. Only a few years after New Zealanders had been fighting Nazis in Europe, Willi Huber was able to slip quietly into New Zealand with the help of our government. He went on to achieve some fame in New Zealand as a skiing “pioneer” through his involvement with Mt Hutt, at which he is still a familiar face. 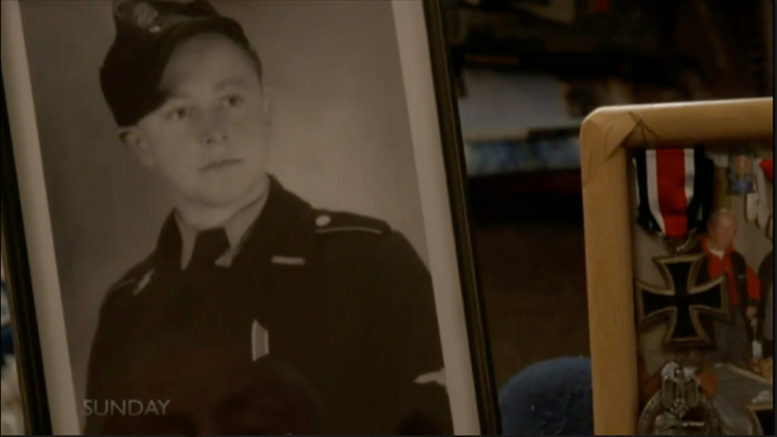 The promo for the program showed a smiling Huber recalling the time he saw Hitler, at aged 9. “Can you imagine?” he reflects, chuckling. He later adds, “I give it to Hitler, he was very clever. He brought Austria out of the dump”, referring to the economic difficulties of Austria in the 1930s. It seems that 70 years after Huber eagerly volunteered to serve on the front line in an SS unit, at least some of that reverence for the Fuhrer remains. He boasted that he was a “good shot” and generally gave the impression that he revelled in his memories of the glory days of the Third Reich. Bennett dutifully pointed out in the piece that “the SS was responsible for horrendous war crimes” and Huber admitted that he and his SS friends agreed that the concentration camps “were wrong but that is about all… what could we do?”. However, Bennett, who is an experienced and well-respected journalist, completely avoided asking the former SS soldier questions that probed deeper than such a simple answer, like whether he saw any of the numerous war crimes attributed to the Waffen SS. Did Huber see Jews being rounded up and murdered or sent in cattle trains to death camps, and did he participate? Has he sought to show remorse or make amends for being a proud Nazi? Does he still consider himself a Nazi and subscribe to its ideology that he wilfully signed up to? So horrendous were the war crimes committed by the Waffen SS, regardless of the record of individual combat units, the entire organisation was declared a criminal organisation by the International Military Tribunal during the Nuremberg Trials. Not only did Bennett fail to properly question Huber about his past, but the Sunday segment, produced by Dale Owens, also minimised the scale of Nazi atrocities. The program referred to “the Nazi concentration camps, which claimed the lives of more than six million people…”. This is factually incorrect. In fact, approximately 3.5 million people were murdered by the Nazis in camps run by the SS and many more were savagely massacred outside the confines of concentration camps. Bennett’s statement also ignores the fact that the six million people he presumably refers to were specifically targeted and systematically exterminated because they were Jewish and it grossly understates the total number of deaths at the hands of the Nazis, which is well over thirteen million. This is not the first time that Huber has been praised unquestioningly by New Zealand media. In The Press in 2014, Mike Crean called Huber “a decorated German war hero” without even mentioning the word “Nazi” or referring to the Waffen SS. And earlier this year Lorna Thornber wrote for Stuff that Huber “worked as a mountain guide in the alps before the World War II broke out and he volunteered to join the German army. He fought in Russia, France and Germany, earning Iron and Second Class crosses, and, after the war ended, was held by the Americans as a “political prisoner” for 16 months”. Numerous other comments criticised TVNZ for not asking Huber the hard questions, but the Sunday program responded that they were satisfied because Huber “spent 16 months in prison” and “Willi explained how he was appalled to find out in 1944 what was really happening in Germany and Poland. He spent WW2 on the Eastern Front fighting against the Russians, and expressed his regrets & sorrow of knowing what else was happening to the Jewish people and concentrations camps. He apologises for all those who died. He doesn’t want to hide anything”. TVNZ Sunday seemed to have no qualms saying these things and believing Huber. However, responsible journalists should undertake some critical analysis, look for more evidence and ask harder questions before accepting and promoting such claims, and any piece that involves interviewing a former Nazi should be handled sensitively and with the utmost care. To glorify a Nazi Waffen SS soldier is to trivialise the horrors of WWII, is an insult to the Kiwi soldiers who fought for freedom, and desecrates the memory of the millions murdered.